It's finally here! Sale-a-Bration is here! What is Sale-a-Bration, I hear you ask? It's s celebration of all things Stampin' Up!, running from today right up until 31st March 2016! Our customers get to choose a free product from the Sale-a-Bration catalogue for every £45 spend in the same transaction (spend £90 to choose 2 products, etc). And our hostesses also receive additional Hostess Credits when they host a Stampin' Up! Party (have you heard about our new online parties? Ask me for more details). 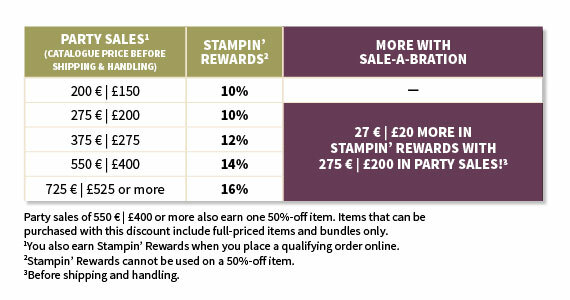 It's also a fantastic time to join Stampin' Up!, as during Sale-a-Bration you get to choose an additional £30 of products for your starter kit (£160 of products of your choice for a £99 investment). And that's not all! The new Spring/Summer Catalogue is out today too (and I have to say, it's my favourite one yet). Labels: Cams Creativity, Sale-a-Bration, Spring/Summer 2016, Stampin' Up!